In February 2009, regional Victoria was devastated by the Black Saturday bushfires. When the Traralgon South community decided to take some Time Out to reconnect, m.a.d.woman joined local supporters to lend a hand. 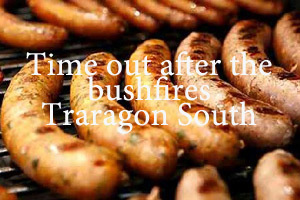 Traralgon South was badly hit – the fires were believed to have been deliberately lit. Ten lives were lost and many homes were destroyed. Just weeks later, the sprouting of pink lillies shows signs of life are beginning to return to the bushfire ravaged countryside. Locals are determined to rebuild and were ready to reconnect with their friends and neighbours. m.a.d.woman put out a call and in just a couple of weeks, collected extremely generous donations from a range of companies and individuals all over Victoria. Toys, drinks, clothing, games, lolly bags and stationery were just some of the items that filled 1000 goody bags. Volunteers from all around pitched in to help -from sausage sizzlers to face painters, fairy-flossers to bracelet-makers and there was even a balloonologist! Celebrities, the Police band and a range of sporting activities entertained the kids and their families. The 10 community members lost in the fires were remembered with special trees and the reading of a moving poem. Thank you to everyone who helped put smiles back on the faces of the people of Traralgon South. You showed that by connecting together,we can all make a positive difference!